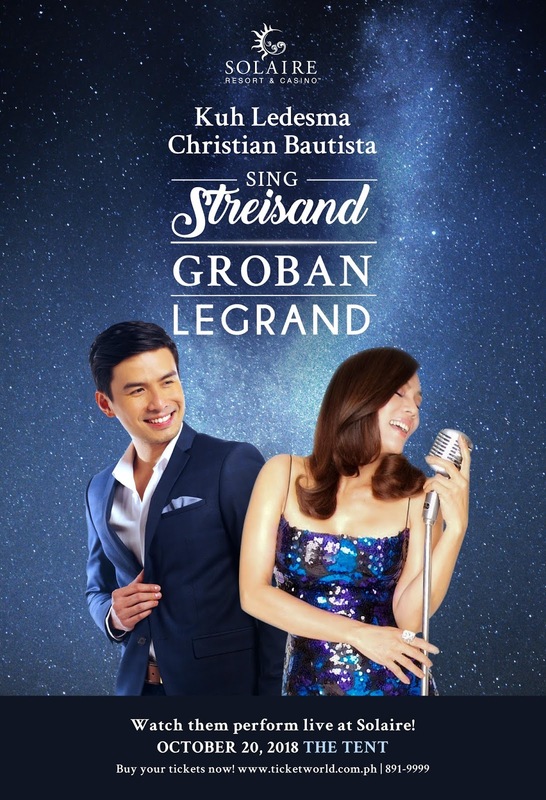 Listen to classic melodies from iconic names in music history be transformed by two of the country’s finest voices in a concert entitled, “Kuh Ledesma Christian Bautista Sing Streisand Groban Legrand” happening on October 20, 2018 at The Tent at Solaire. As an advocate of Filipino artists, Solaire showcases yet another pair of brilliant stars that will serve as the opening act in the integrated resort’s newest event venue, The Tent. “The Tent seeks to accommodate Solaire’s ever expanding entertainment fare. We can now simultaneously hold concerts and musicals in two spaces for our guests’ enjoyment. It is quite fitting that The Tent’s maiden offering is “Kuh Ledesma Christian Bautista Sing Streisand Groban Legrand” as it speaks of how time is a transforming force, a common thread that the artists and Solaire have experienced over the years. It will truly be a wonderful night of beautiful music.” says Audie Gemora, Solaire’s Director for Entertainment. For tickets to “Kuh Ledesma Christian Bautista Sing Streisand Groban Legrand”, you can call TicketWorld at 891-9999.